Compost is one of those wonderful things that can turn waste into a useful product. Urban hugelkultur raised garden beds are the perfect way simplify an already useful process. Hugelkultur, which basically consists of burying some logs below your garden, allows you to recycle bits of wood from around the yard and compost them into wonderful fertile soil (without all the turning and spreading of traditional composting). Hugelkultur combines in-place composting with raised garden beds. Hugelkultur raised beds, or “hugelbeds”, are mounds constructed out of woody debris, nitrogen-rich material, and soil. The bed composts-in-place, creating a rich growing environment for your garden. The wood becomes spongy as it composts, soaking up lots of water from the surrounding soil. After a year or two, the hugelbed barely needs to be watered at all. This is because the bed is mimicking a natural woodland. Wild forests do not require irrigation because the forest floor is able to retain so much moisture. Fortunately, we can take advantage of this principle in the city with urban hugelkultur. Another benefit of hugelkultur is the self-fertilizing feature. The composting wood and manure provide the plants with a consistent source essential nutrients for many years. The hugelbed also deflects wind, and can be used along the perimeter of the property as a shelter feature. Lastly, hugelkultur beds are among the first to thaw in the spring. This is partly because they are above ground level, but also because the composting wood creates heat. This extra heat at the beginning of the season can add several weeks onto the start of the growing season. Create a raised warm environment for early season crops. Given these benefits, hugelkultur is particularly well-suited to the urban environment. Many urban lots have poor, compacted soil. Building an urban hugelkultur bed overtop of the poor soil makes it possible for plants to thrive in healthy soil despite the poor existing soil at the site. 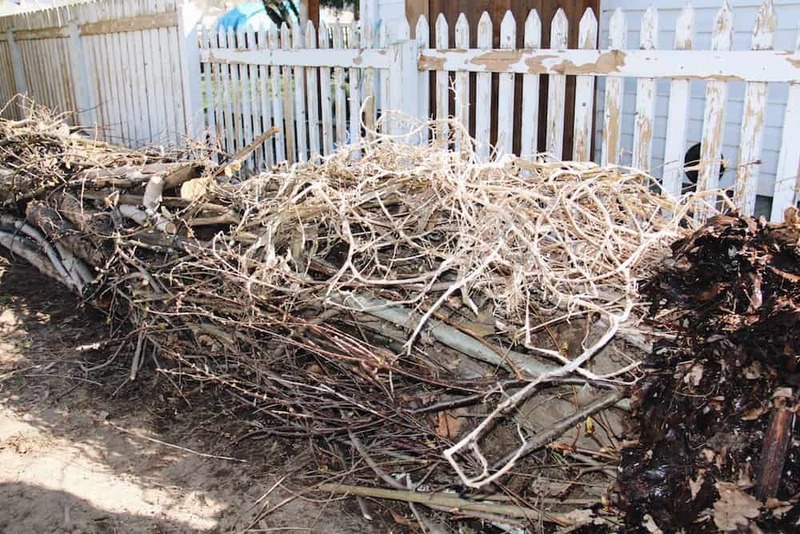 Let’s get into what you’ll need and how to build a hugelkultur garden bed. Birch is best. Alders, apple, aspen, cottonwood, maple, oak, and poplar are also good. Hardwoods are prime hugelkultur candidates. In general, deciduous wood is generally better than conifer (evergreen) wood for hugelbeds. Stay away from cedar and black locust (slow to decompose), and black walnut (produces a toxin which prevents growth of other plants). Seeds (consider squash, sunflowers, kale, lettuce, peas and any other crops that grow easily from seed). Measure out the area for the hugelbed. The hugelkultur will likely be approximately 3-5 feet wide, and can be as long as you like. Once you have rough measurements, calculate how much wood and soil will be required. Using equal parts of woody material and soil is generally the easiest. For a small hugelkultur bed, each 10′ of length will require 1 yard of wood and 1 yard of soil (1 yard is approximately 1 full pick-up truck). 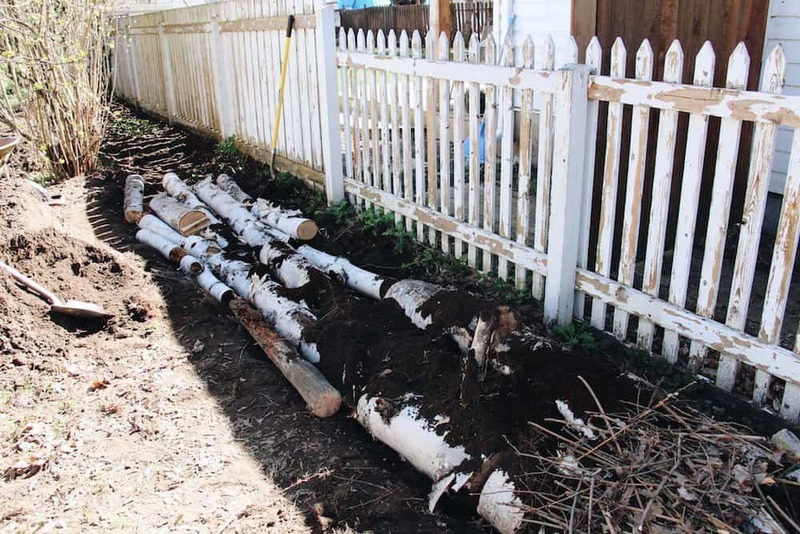 For a larger hugelkultur bed, use the same amount of wood and soil over a 5′ length. Measure out your nitrogen-rich material. For each cubic yard of wood used, add one cubic foot of composted manure (or other nitrogen-rich material). Dig a trench within the perimeter of the hugelbed. The trench can be anywhere from 6 inches to 2 feet deep. The deeper the trench, the more opportunity for water absorption. Place the largest logs on the bottom of the ditch. These logs will act as a wicking bed to draw up groundwater. 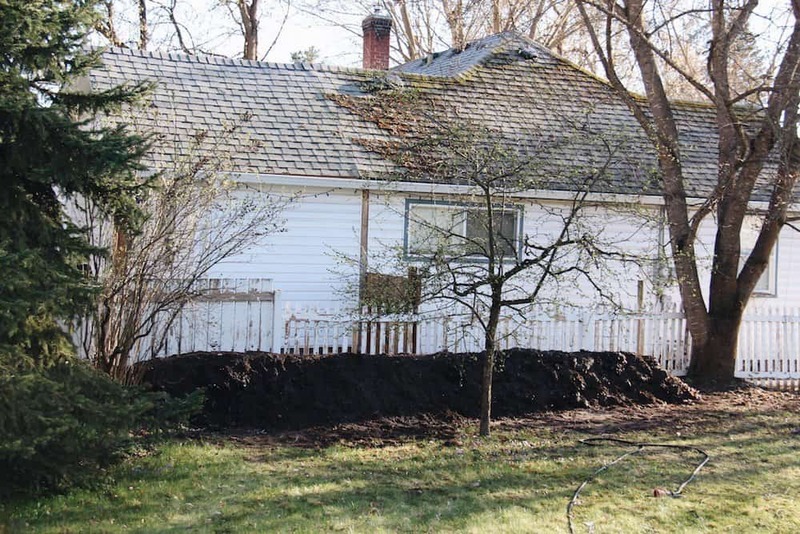 Place some soil and manure on top of the logs. Push the material down into any open spaces between the logs to fill any air voids. Water the logs/soil with the garden hose. Add another layer of smaller logs and branches, filling all the spaces with soil, manure, and/or leaves. Continue to water the hugelbed during construction. Keep adding layers of logs. 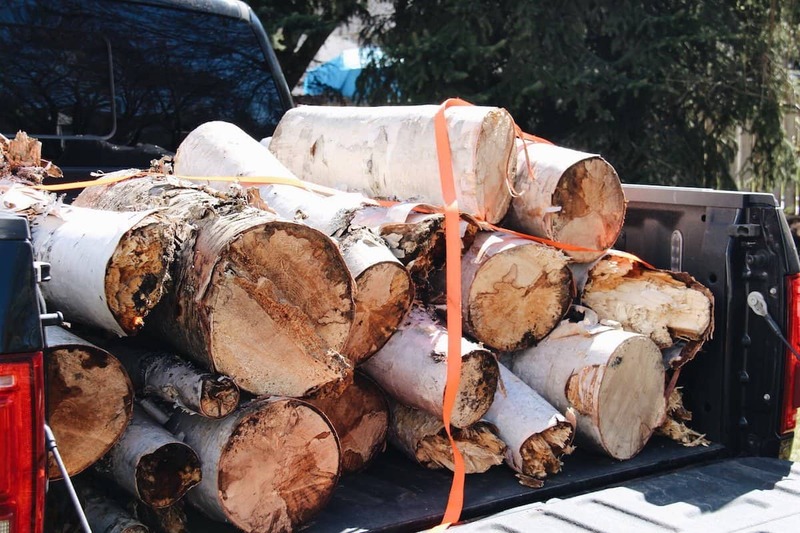 Fill the spaces between logs with soil, manure, and leaves. And keep watering! Once all of the woody material has been placed, cover the hugelkultur bed with soil and water the finished hugelbed. Seed the bed heavily with seeds of your choosing. Common seed choices include trailer plants such as squash and root crops near the bottom of the bed. The middle third is often planted with beans, peas, flowers, kale, and lettuce. The top of the bed is generally planted with drought-tolerant flowers, sunflowers, tomatoes, peppers, and corn. Use several times more seed than you expect (this will help to drown out weeds). Give the bed a final watering. Enter your info to subscribe and get your printable instructions! These instructions are much easier to use outdoors. 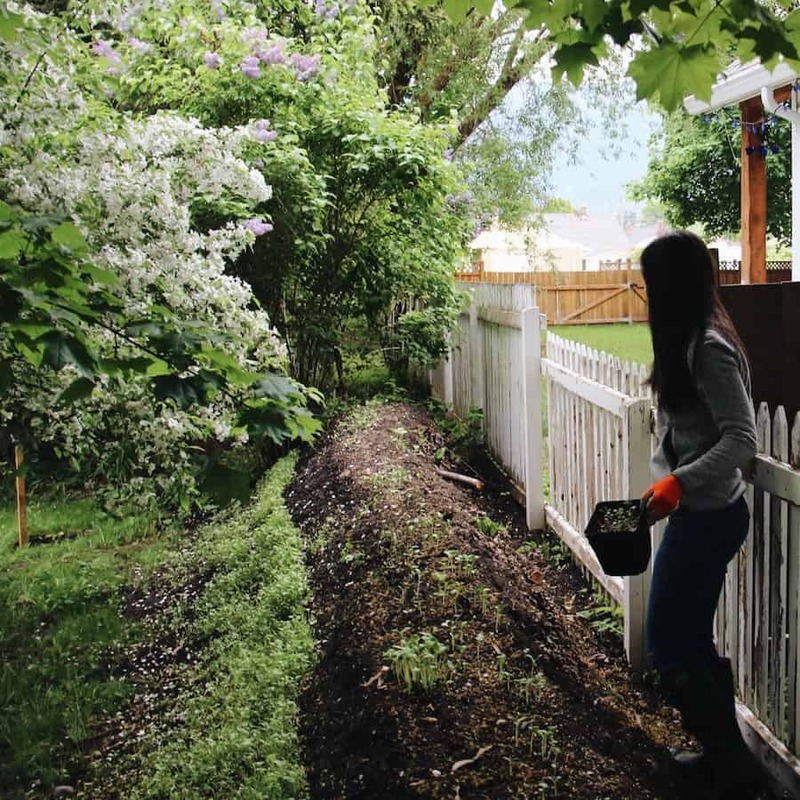 Upgrades to an urban hugelkultur bed include adding mulch and creating a stone border. It can also be planted with perennial plants once it’s had a season or two to settle. The hugelbed is a great way to build soil. The pile will settle by about 6” in the first year, and continue to settle (although not nearly as much) in the years to follow. After several years of settlement, transition the bed to perennial crops. Have you built a hugelkultur bed? Do you have questions? Share your stories and questions in the comments below! For detailed reading about hugelkultur, check out Sepp Holzer’s Permaculture Book. How cool! I have never heard of this before…what a fantastic idea. Beautifully explained Mary Jane – I just shared this with my Facebook friends I enjoyed it so much :) Cheers!